Discover how social mood motivated three headline-grabbing global developments and uncover what to look for in the months and years ahead. How? By putting the most exciting new behavioral approach at your fingertips. Flip through the latest news stories. Now, imagine scrolling through the same items, nodding, saying, "THAT makes sense." And "THAT is right on time." That is what Socionomics Members get every month. The same events that disrupt most people are confirmation to them. You can join them. The science of socionomics starts with an indisputable observation: How people FEEL influences what they DO. If you know how someone is feeling, you have a leg up on predicting how they will behave. We zoom out. 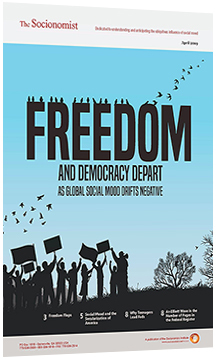 We look at how society is feeling so that we can understand--and even anticipate--how society behaves. As we track social mood in real time across the globe, we chart how its changes produce shifts in everything from the songs people want to hear to the leaders they elect to their desire for peace to their hunger for scandals to the trajectories of their stock markets, and more. This is the great insight. It's what enables the Socionomics Institute - and its members - to stay ahead of all others. Each month the Institute's analysts show members how today's - and tomorrow's - most important trends will unfold. They give members an unrivaled perspective on the future, putting them miles ahead of herd. Every book, DVD, paper, webinar, you name it--in digital format as soon as it's released. For a limited time, we've created two easy ways for you to become a member.